I've designed around 15-20 websites from scratch in the last 5 or so years. Here are a selection of my projects over this time, focusing on the most recent. For all my sites, I provide a full service which involves managing the hosting and domains, advising on and commissioning content, copywriting, search engine optimisation and anything else a client requires. I'm always available to guide non-web-savvy clients through any part of the process of owning and operating a professional website. To find out about alanmccann.co.uk itself there is a special section here. Note, wherever possible I link straight to the current, live site, but in some cases the site has closed and the domain is no longer there. In those cases I have mirrored the site on alanmccann.co.uk but some functionality might be missing. Singer/songwriter Kirsty Crawford's official website is a fully featured Flash site launched in August 2005 (see promotional e-mail design). The official Kirsty Crawford site was developed as part of my ongoing work with Rocket Music Management Ltd. Extensive meetings and discussions ensured that the site reflected exactly what the artist and management required and I was even present to help direct photography at two dedicated photo shoots. All sites I have developed for Rocket Music feature a bar along the bottom which promotes other sites in the network. What at first just looks like a series of links pops-up a floating information box as each artist's url is hovered over. This promotes each other act in the roster without intrusion and each bar, though identical in format, is styled according to the host site. Visit www.kirstycrawford.com, www.rocket-music.co.uk or www.johnandcece.com to see for yourself. I developed this site for South African singer/songwriter Lisa Theunissen based on an original design mock-up she provided, working with her to ensure the site reflected her promotional ambitions, and was also easy enough for her to update herself. The Complete Stone Roses are one of the most successful tribute acts in the UK, seen by 70,000 paying fans each year and frequently selling out top venues such as the Carling Academies. Their website at stoneroses.net has been designed to serve as an online reflection of that success and a resource for fans and promoters alike. Their new site has been built within a content management system and is designed to be updateable by the band's management on the road. This is key to ensuring that all gig dates, news items and photos are as up to date as possible. I am also currently conducting an overhaul of the largest Stone Roses website on the net, porting the old content into a new refreshed design which will sit as a sister site to stoneroses.net. Developed as a corporate website for the private hire and booking of five of Chelsea's most fashionable nightclubs and bars, chelseavenues.com has a clean corporate feel with subtle style. 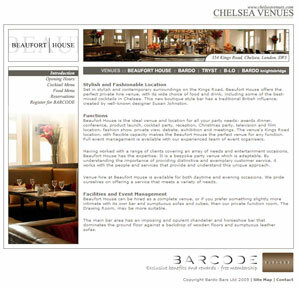 As well as providing a central site for corporate customers, chelseavenues.com contains a minisite for each of the five featured venues, with tailored information and photography set within the overall site style. Completed in April 2003, thestar69.com was a fully-featured, technologically diverse and heavily client-driven project, designed for Scottish soft rock band Star 69. Site features include: gallery, downloadable Flash desktop clock, fanbase building guestbook and mailing list, custom-built Flash MP3 Player, RealPlayer SureStream built into MP3s page, enables users with both fast and slow connections to listen to the band's music, streamed dynamically to suit the user's computer. The online branding of the up-and-coming quartet was begun as early as Summer 2002 when work was completed on the band logo. From there, constant discussions with the band's frontman and management developed the look, feel and style of the band's digital presence. During several iterations, such as an early beta site, key decisions, including band font, colour scheme and graphic style were made, giving a solid visual foundation on which to build the final version of the site. Closed when the group disbanded over a year ago, the site had just launched a new customised fan forum. 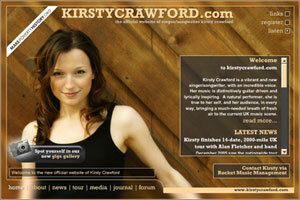 This redesign of the hugely popular Kirsty Crawford fansite at kirstyc.com was intended to bring the fan website more in line with Kirsty's musical style. The original site (featured on this page ) was built before I knew Kirsty and before much of her musical development. As kirstyc.com has always ranked above her official site in search engines this redesign was important to ensure that people got the right first impression of this modern singer/songwriter.